Lock in a great price for Los Patios Hostal Boutique – rated 9.4 by recent guests! Los Patios is fantastic. Modern hostel with all the amenities. 10 min walk from Metro. Lots of restaurants within minutes. Staff were very professional and spoke great English. Room was quite large and had air conditioning. One of the better accommodations we had in Columbia and we wouldn't hesitate to stay here again. hands down my favourite accommodation during my travels in south america. would recommend to anyone visiting medellin. the two rooftop bars have incredible views of the city during the day and night. the staff were very warm, friendly and always answered my questions. I booked a number of tours with the hostel and they were all very reasonably priced and great fun. my shared room had keycard access making it feel secure, there were also spacious lockers inside. the hostel offers daily activities which along with the rooftop bars make it an easy place to meet new people for solo travellers like myself. would recommend this place to anyone visiting medellin, my only regret is not being able to stay there longer then I did. We only stayed here one night and had a very early flight but are quick stay was good. We had a private room and it was excellent very spacious, clean and comfy beds. The hostel itself is very nice they had two building and it looks like lots of options for activities. The staff were great checking us in and gave us lots of information on activities. It has a nice rooftop patio as well. The best and nicest hostel in El Poblado. Definitely recommend to stay! Free coffee was great, and having a space to workout (albeit small) was nice. The staff is extremely friendly and helpful and will go out of their way to make you comfortable. The people who work at Los patios are just amazing people. The team that i have exceeded my expectations. I believe the people are what make this place so accomodating and special. The atmosphere is very homelike and modern with an eclectic and earthy feel. Thabk you to Sara, Jose, Daniela, and the rest of the team for making my stay a memorable one! One of our top picks in Medellín – and a guest favorite. 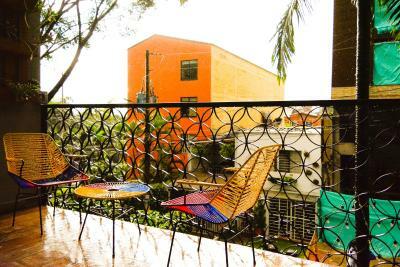 Los Patios Hostal Boutique is a stylish hostel located in Medellín in the Antioquia Region, 1,300 feet from El Poblado Park and within a 5 minute walk from Lleras Park. Guests can enjoy a drink at Ziruma tiki bar located in the terrace with 360 views of the city and the mountains. The nearest subway station is 1,650 feet away. The rooms in this property are set in themed levels inspired by Colombia's different regions. Certain units have a seating area to relax in after a busy day. A flat-screen TV with cable channels is provided. You will find a gift shop at the property and a playroom with a 50-inch TV with surround sound system. An organic herb garden is available for guests to use in their preparations at the property's communal kitchen. Guests can enjoy various activities in the surroundings, including cycling and hiking. The guest house also offers bike hire. Pueblito Paisa is 1.7 mi away. Jose Maria Cordova 19 mi from the property and Medellin's South Bus Terminal is 1.2 mi away. 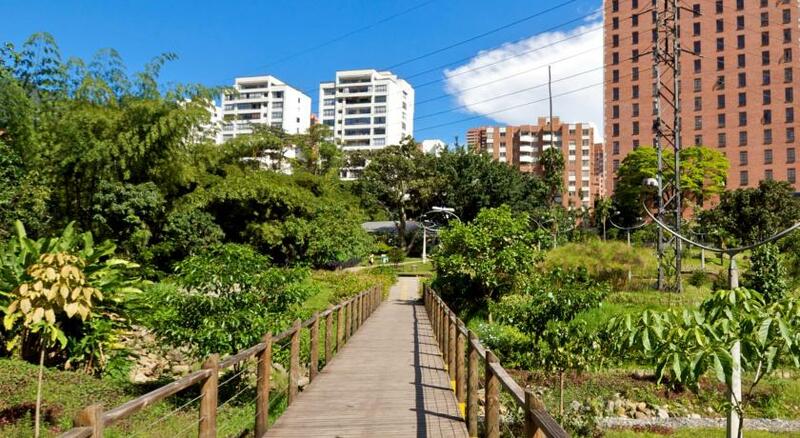 This property also has one of the top-rated locations in Medellín! Guests are happier about it compared to other properties in the area. 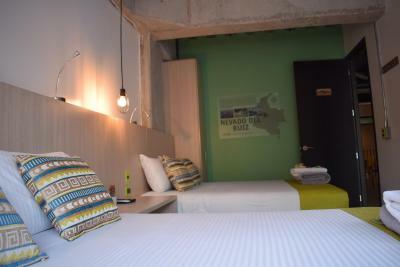 When would you like to stay at Los Patios Hostal Boutique? This double room has a flat-screen TV and and safety box. This double room features a safety box and fan. This triple room features a balcony with a mountain view and a fan. This triple room features a flat-screen TV and a fan. This dormitory room has fans for every bunk bed and reading lights. This bed in dormitory features a balcony with a mountain view and a seating area in the terrace. It has a private bathroom. This twin room features a flat-screen TV, safety box and fan. This bed in dormitory features a tile/marble floor and private entrance. This bed in dormitory features a private entrance, tile/marble floor and seating area. This bed in dormitory has a tile/marble floor, seating area and private entrance. This bed in dormitory features a tile/marble floor, private entrance and seating area. This bed in dormitory has a tile/marble floor, private entrance and seating area. This bed in dormitory features a private entrance, seating area and tile/marble floor. This bed in dormitory has a tile/marble floor and private entrance. This bed in dormitory features a private entrance and tile/marble floor. This bed in dormitory has a private entrance and tile/marble floor. Area Info – This neighborhood is a great choice for travelers interested in nightlife, food and friendly locals – Check location Excellent location – show map Guests loved walking around the neighborhood!